Over/Under: Under 220.0 at 1.90 Bet Now! There is no let-up in the action in the NBA Conference Finals and we are straight into Game 2 in the Western Conference Finals. The Golden State Warriors made the most of home advantage in the opening game with a 110-106 win against the Houston Rockets, and they will be keen to take a 2-0 lead to Houston with them. Of course, the Rockets will be just as keen to take a 1-1 score-line to Houston. In the opening game of the Eastern Conference Finals on Wednesday night, the Cleveland Cavaliers took a big step towards making it to the NBA Finals. They managed to grab a win in Atlanta, downing the Hawks by a score of 89-97. There is still a very long way to go when it comes to deciding who is the best in the East but the Cavs laid down an impressive marker in their opening game and it will be interesting to see how that series pans out in the next few games. However, while many people in the world of basketball are wondering whether LeBron is going to lead another team of his to the NBA Finals, the Rockets have their own issues to contend with. James Harden carried the team for a great deal of the season, with the Rockets being without Dwight Howard for lengthy spells. There is now a strong chance that Howard will be unavailable for Game 2 on Thursday due to a knee injury. When you take on board the fact that the Rockets already had a few injuries and issues to contend with, they are certainly up against it. This is sometimes the sort of situation that brings out the best in a team, and it could be the spur the Rockets players need to tie this series before they get to play in front of their home fans. Even with Howard on the court, the Rockets were up against it in trying to contain Stephen Curry, Klay Thompson and the rest of the rampaging Warriors. The Golden State side may have bene 16 points behind in the second quarter in Game 1, but they bounced back and won strongly. The fact that the Rockets held a decent lead at one point will provide them with some confidence going into this game, but the Houston side knows that they will need to up their game considerably to stand a chance of grabbing a good result in this one. If Howard is unable to play, the Rockets may turn to Clint Capela. This will be a big jump for a player who has featured in the NBA Development League this campaign but he managed 9 points and 4 rebounds in Game 1, so he may be given more time in this one. The Rockets really need to get more from their bench in Game 2. They are without Donatas Motejunas and Patrick Beverley, and their bench didn’t offer up much in Game 1. Pablo Prigioni offered up 4 points, Terrence Jones provided 5 points and Corey Brewer offered up 9 points. This is in contrast to the Warriors who were provided with 18 points from Shaun Livingston. The Rockets record is currently 64-31 for the season and they have a 27-19 record on the road, with a 5-5 record in their 10 most recent games. The Warriors have a 76-17 record, which includes the previously mentioned 44-3 record at home and they currently have an 8-2 record in their last 10 games. The Warriors are very much in the lead for average points scored and average points conceded this season. With respect to average points scored, the Warriors are ahead 109.1 to 104.1 and for average points conceded, the Warriors lead 99.3 to 102.0. 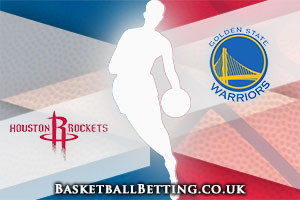 The bookmakers are making the Golden Warriors big favourites for this game, and they can be found at odds of 1.14 when it comes to the Money Line bet. You will be able to find the Rockets at +10.5, at odds of 1.90. When it comes to the Over/Under market, look to go UNDER 220.0, which is available at odds of 1.90 as well. Bet Now!